After a remarkably smooth and uncontentious process, Charlotte Mayor Anthony Foxx has just been confirmed by the full Senate as the 17th U.S. Secretary of Transportation. Not a single senator voted against — or even abstained from — his confirmation. 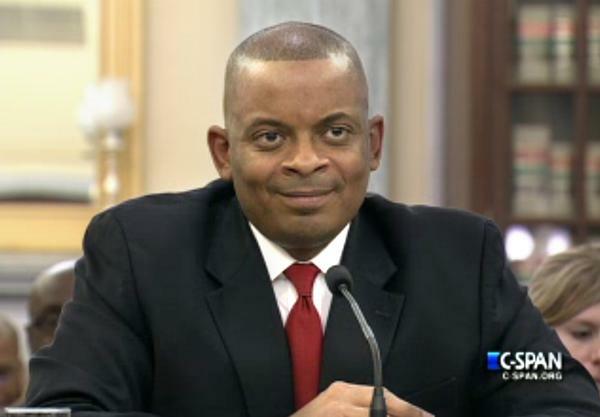 Anthony Foxx has been confirmed by the full Senate to be the next Secretary of Transportation. Coming to the position as the mayor of a major southern city, Foxx brings with him an understanding of urban concerns and has translated that understanding into a firm support for smart urban solutions: light rail, streetcars, bike and pedestrian infrastructure, and transit-oriented development. His confirmation hearing last month gave some more indication of what kind of secretary he would be, as he promoted TIGER and put faith in technology and performance requirements to stretch limited dollars. Foxx will likely be sworn in next week and begin work at the department. Congrats! If he can take the good stuff he did in Charlotte and broadcast that to cities all over the country, we will do well. But Durbin voted yes, so this isn’t going to happen at this time. This kind of symbolic politics is anything the country doesn’t need of anymore. In any case, couldn’t Durbin open those discussions without that symbolic “no” vote? Even if it could, this is bad policymaking. It isn’t made better because you support the cause. If you are okay with people stalling nominations or voting against something they agree with just to get press coverage, don’t complain when someone forestalls a subway project just to make a point about, say, motorbike helmet laws. When did I say I was okay with people stalling nominations to get press coverage? What I said was that Durbin, being a U.S. Senator, is perfectly capable of getting press coverage (for discussions about over-reliance on automobiles or otherwise) WITHOUT this kind of grandstanding. What Kind of Transpo Secretary Will Anthony Foxx Be?